Ms. Shaw is Cooler Than Mom | What is ML Reading? ML’s teacher is Ms. Shaw. She is way cooler than I. If ML sees her when I pick her up from afterschool, she runs to hug her. One would think ML hadn’t seen her in months instead of 3 hours. Poor Ms. Shaw is almost tackled. 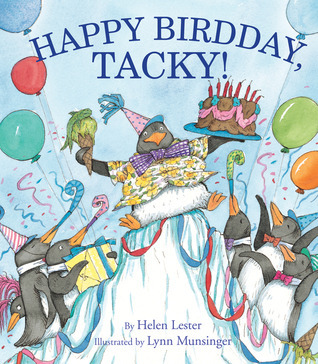 This winter, I tried to read Tacky the Penguin by Helen Lester to ML. Tacky is an odd bird with a horrible singing voice. I can relate. Each winter, I belt out the words to his song. The preschoolers love it. I thought ML would too. She didn’t! Luckily, she didn’t get her mom’s musical ability; the singing hurt her ears. “MOMMY STOP!” she said forcefully. This week the library received a brand new Tacky book. Happy Birdday, Tacky! (That isn’t a spelling error) Last night was Spring Fling at her school. We closed the party down. It was too late to read books. Confession – Even librarians don’t read to their children everyday. ML saw the Happy Birdday, Tacky! book in the new library book stack. She was excited, “Mommy, it’s Tackylocks.” Tacky has a series of funny books. Tackylocks and the Three Bears is one of them. I knew I hadn’t read Tackylocks to ML. I admit I got a little defensive, “Who read you Tackylocks?” I wanted to be the one to promote a love of Tacky. It was her teacher Ms. Shaw. Thank you Ms. Shaw for doing what I couldn’t do. 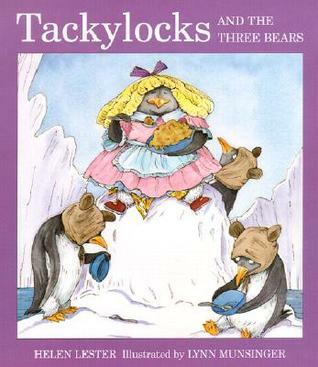 Tacky is one of my favorite characters in children’s literature. Not wanting to scare ML away from Tacky again, I’ll try to sing Happy Birdday to Tacky in a harmonious voice tonight. Helen Lester, the creator of Tacky books has written many hilarious books. Your public library should have them. Put them on your list of must reads today. This entry was posted in Picture Book and tagged Happy Birdday Tacky! by mlreads. Bookmark the permalink.